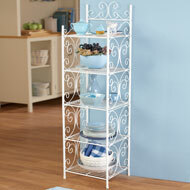 This attractive wire rack instantly provides extra storage and style for your home. It features a contemporary metal design with 3 shelves that provide plenty of room for towels, bath supplies, decorative items, books and more. Sturdy metal construction, easy assembly required. Metal. Measures 13"L x 11"W x 27 1/4"H.
Tall boot rack features boot posts that help keep the shape of your boots intact and the tilt out feature allows easy access and storage. Each boot rack can hold 3 pairs of boots and 3 pairs of shoes on the shelf above. Metal. 26"L x 10"W x 26 1/2"H. This item ships from a separate warehouse and will arrive in a separate package. This beautiful shelf instantly provides extra storage and style for your home. 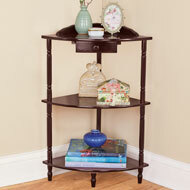 It features a lovely scrollwork design plus 5 shelves offer room for towels, decorative items, books and more. Sturdy metal construction. Metal. Measures 14"L x 12"W x 46 1/2"H.
This beautifully detailed corner table provides stylish display and storage space. The elegant table is finished with a dark cherry color, and the three shelves are perfect for displaying your collectibles and decorative items. A drawer slides open underneath the top shelf. Wood.  19 1/2"L x 13 1/2"W x 27 1/4"H. Item can only be shipped to the 48 contiguous United States and cannot be expedited. Cannot ship to P.O. Boxes, APO/FPO. 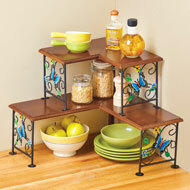 This versatile corner shelf will add storage space to any corner of your kitchen. 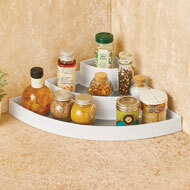 Perfect inside a cabinet or on a countertop, it instantly organizes spices, sauces, condiments and more for easy access. Three slipresistant shelves keep your items from moving around. Wipes clean. Plastic. 16 3/4"L x 12"W x 3 1/2"H.